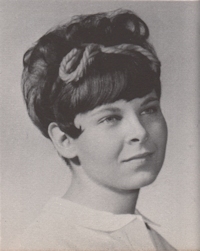 Obituary – Estes, Deah Suzzann (Smith) « Perry High School Alumni Association, Inc.
Office Staff 65-67; F.H.A. 65-66; Thespians 67-68; All-School Revue 65-66. Deah Suzzann Estes, 54, of Stillwater, formerly of Perry, died Monday, Sept. 20, 2004, at her home. Memorial services will be at 2 p.m. Saturday in the First Christian Church in Perry. The Rev. Martin Foster will officiate. She was the daughter of A.L. and Wilma May Smith and was born in Guthrie Jan. 8, 1950. She was a 1968 graduate of Perry High School. She attended nursing school in Kansas and graduated with an associate’s degree. She was also a homemaker who loved her grandchildren, collected angels and enjoyed working in her yard. She was a member of the First Christian Church. Her father and one son, Rodney Karcher, preceded her in death. Survivors are one daughter, Lori of Stillwater; her mother of Perry; two brothers, Clark of Perry and Larry of Guthrie; two grandchildren, Journey and Austin both of Stillwater; and a special friend, JoAnn of Perry.